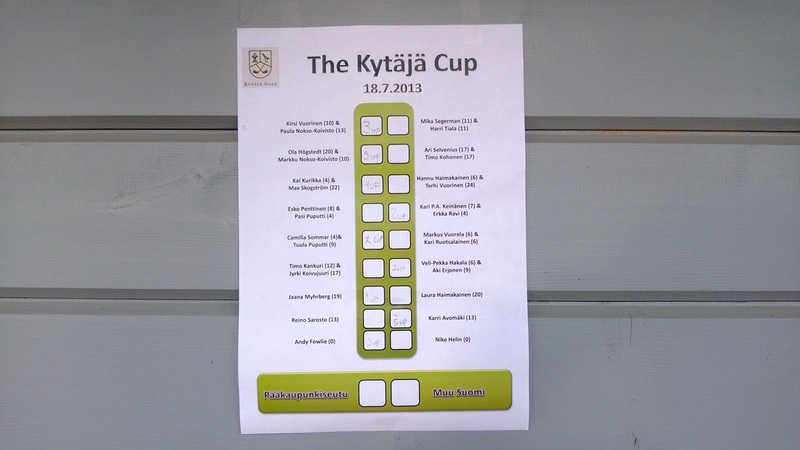 The second annual Kytäjä Cup was played on the South East course on 18th July 2013. The match is played between two teams of Kytäjä members, Pääkaupunkiseutu (those players living in the capital area - Helsinki, Espoo, Vantaa, Kauniainen) against Muu Suomi (those players living in the rest of Finland). For the second year running the team captains were Andy Fowlie (Pääkaupunkiseutu) and Niko Helin (Muu Suomi). The weather did not look very encouraging as the matches left the first tee, and there were periods of rain during the game, but thankfully the rain did not get very heavy at any point and the weather was not able to spoil the occasion. The idea of the Kytäjä Cup is to add a team golf event, similar to the Ryder Cup, to our competition calendar, so that our members can experience the excitement of team golf. The matches were all played in a matchplay format and the pairings were made in such a way that every match could be played without handicaps. The formats of the games were the same as the Ryder Cup (foursomes, fourballs and singes). The pairings for each match can be seen below. The two captains were playing against each other in the final match, this allowed them to take care of some practicalities for the other matches. Niko was on duty in the clubhouse (warm and dry, with coverage of the Open Championship on the television) helping the players to check-in and answering any questions about the event, while Andy was acting as the starter on the first tee (cold and wet, no television). The good competitive spirit in which the event was played was in evidence already in the photographs from each match on the first tee, as can be seen below. The Pääkaupunkiseutu team made a fast start, perhaps eager to get revenge for their defeat in the 2012 event, and the half-way leaderboard (taped to the wall of the kiosk) indicated that they were ahead in 6 matches, while Muu Suomi were ahead in 3. As the back nine progressed there were some changes of fortune, notably from Timo Kohonen and Ari Selvenius who fought their way back from 3 down to record a victory on the 18th hole and from Esko Penttinen and Pasi Puputti who managed to overturn a 2 hole deficit... but in the end the overall pattern remained the same as it had been after nine holes and the Pääkaupunkiseutu team secured victory by 5½ to 3½. Overall this was another great day for our golf club. The matches were played in a great spirit, some good golf was played, and the players enjoyed the opportunity to play for a team in the traditional formats of team golf. Hopefully this event will continue to grow in future years! Pictures from the event can be seen in the gallery below.